Remarkable Marketable Me: How do you keep the music playing? 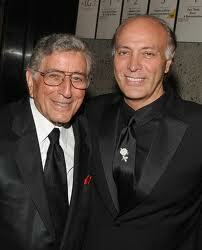 Just ask Tony Bennett ! How do you keep the music playing? Just ask Tony Bennett ! 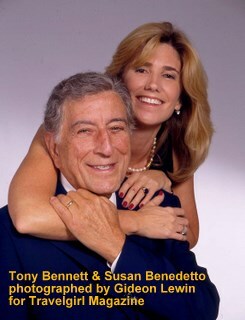 My family and I have always loved Tony Bennett. My brother Teddy has had the great pleasure of working with Tony and is a big supporter of his "Exploring the Arts" charity. Tony Bennett, one of the legends of jazz and popular music who served during the Second World War and then developed a career spanning over half a century is truly an American treasure. He knows what it takes to keep his music playing and now shares that gift with children and young adults.. In 1950, Tony successfully auditions for Columbia Records’ producer Mitch Miller, singing “Boulevard of Broken Dreams,” and signs with the label. 1951 Scores his first hit, “Because of You,” which peaks at No. 1 and remains on the charts for 32 weeks. His next single, Hank Williams’ “Cold, Cold Heart,” becomes the first notable cover of a country tune. Both feature the Percy Faith Orchestra, which provides the lush backdrop of 24 Top 40 tunes he charts before 1964.In 1962 Records his first Grammy Award winner – and his subsequent trademark tune – “I Left My Heart in San Francisco.” Released as a single by Columbia, it remains on national charts for nine months. When the song’s album is released, it goes gold. The song was written by then-unknown songwriters George Cory and Douglass Cross.1972-1977 Changes labels from Columbia to MGM Records and, by the mid-1970s, decides to form his own record company, Improv. Makes several albums for Improv, including two critically-acclaimed duet records with jazz pianist Bill Evans in 1975 and 1977. 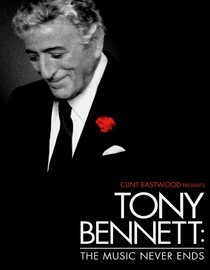 In 1979 Son Danny, who becomes his manager, begins forging the next stage of his pop icon father’s career, which yields a new era that brings an overwhelming affinity from the next generation of audiences.In 1986 Touring regularly in concert halls around the world, Bennett finds a growing appreciation for traditional pop music as performers like Natalie Cole and Linda Ronstadt record albums of standards. In this new environment, Bennett re-signs with Columbia records and releases The Art of Excellence, his first chart album in 14 years.In 1990 The first celebrity guest artist to “appear” as himself in the animated hit The Simpsons – in the episode entitled Dancin’ Homer- Bennett starts to break ground with a younger set of fans. 1993 Bennett’s tribute to Fred Astaire, Steppin’ Out, goes gold, and he wins another Grammy Award for Best Traditional Pop Vocal Performance. The video is included in MTV’s popular program Buzz Bin and he is nominated for an MTV Video Music Award. Presenting with the Red Hot Chili Peppers – alongside Anthony Kiedis and Flea – at the MTV Music Video Awards cements Bennett’s reputation as the epitome of cool. The Red Hot Chili Peppers are just one of the alternative rockers who will cite Bennett’s influence on their music.2003 Makes cameo appearance in the film, Bruce Almighty, starring Jim Carrey and Jennifer Aniston. Along with k.d. lang, wins a Grammy for A Wonderful World.2006 In celebration of his 80th birthday, Tony Bennett Duets: An American Classic is released and becomes the highest charting and best selling CD of his career, reaching platinum status in less than three months. 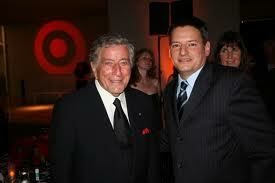 As you can see Tony Bennett has the ability to stay on top in the music industry and is a great gift to the children he helps! Teddy's documentary about Tony Bennett is a great source of information just click on this link below to see the Netflix information about the documentary. Thank you so much for thinking of us. Ted is an incredible Board member and supporter of ETA. ETA's mission is to strengthen the role of the arts in public high school education. ETA's programs connect private funders, individual artists, and cultural institutions to Partner Schools to achieve greater equality of resources and opportunity for youth of all means and backgrounds. Exploring the Arts' Tony Bennett Apprenticeship Program places 11th and 12th graders from ETA Partner Schools as apprentices with professional artists and as interns at arts organizations. Participating students forge mentoring relationships with creative professionals, explore career opportunities in the arts, and gain work experience in their field of choice. Students apprentice during a school year-long session through the Fall and Spring or during a Summer Intensive session. Students receive a financial stipend. To support this program & others like it, click here to make an online donation. One of us an artist and the other a former public school teacher, we have always shared a combined passion for arts education, and it was our longheld dream to give back to the communities and institutions that had for many years helped shape our own dreams and careers. This led to our first major endeavor, the founding of Frank Sinatra School of the Arts, a New York City high school where students pursue an equally rigorous arts and academic curriculum. It was very important to us that this be a public school, accessible to all children, regardless of their need or background, and it is with great joy that we have watched the school's students achieve at such extraordinary levels since the school first opened in 2001. We first established Exploring the Arts (ETA), our nonprofit charitable organization, to provide additional support to the Frank Sinatra School's arts programs. It is all too often that public schools face budget cuts and must forego their arts offerings, and it has been our greatest pride and joy to watch the Frank Sinatra School succeed aided by this additional help. Inspired by the school's success, we broadened ETA's mission so that we could expand our support to more public high schools with deserving arts programs, and so in 2008 ETA began assisting new partner schools. Our commitment to arts education has only grown stronger each year as we witness the powerful, positive impact the arts have in the schools we serve. On behalf of the talented, student artists we serve and their dedicated teachers, we thank you for your interest in Exploring the Arts and for sharing our commitment to the importance of arts education. We have been lucky to see our greatest dreams come true, and now it gives us great pleasure to help the next generation of artists and leaders fulfill their own dreams.